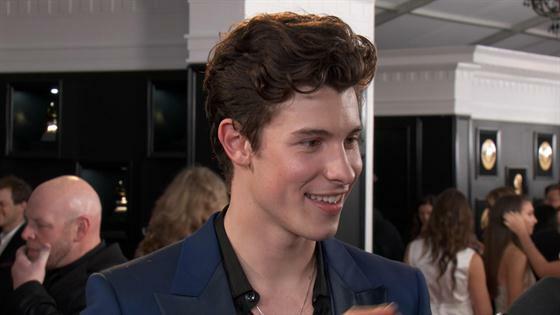 Shawn Mendes Reveals His Inspiration for "In My Blood"
Shawn Mendes is opening up about what it took to write the chart-topping song "In My Blood." The Canada native took a break from the red carpet to chat with E! News' Ryan Seacrest, where he is revealing how "hard" it was to delve deep into his emotions. He tells Ryan that it's difficult "to be 100% honest with yourself and not lie in your music." However, his hard work has definitely paid off since he is nominated for two awards, with "In My Blood" getting a nod for Best Song of the Year. This has brought immense joy to the singer-songwriter, especially since it's such an important message. "I think there's not a better song that I could be happier to be nominated for an award tonight. I think it means the world for a lot of people," he explains. And there's no doubt that he will deliver another astounding performance at tonight's show when he sings with Miley Cyrus. No one is more excited for fans to see them together than Shawn himself. He says that the singer is an "incredible" performer who he is honored to have the chance to work with. Best of luck to Shawn at tonight's show! To see the full list of tonight's winners, which will be updated throughout the evening, check out the list here!